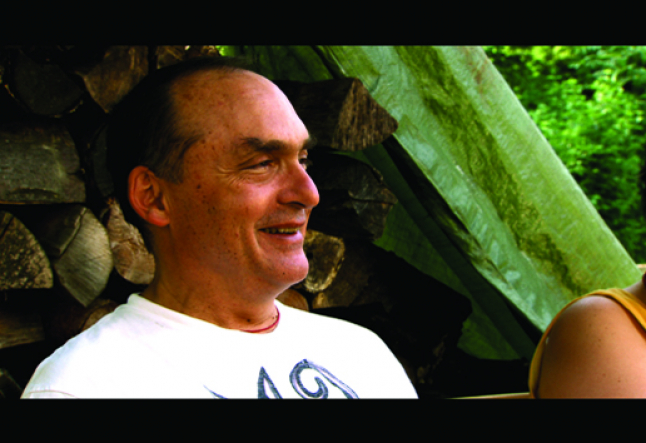 According to Zen priest and chef Edward Espe Brown, “When you’re cooking, you’re not just working on food, you’re also working on yourself and other people.” Brown’s message, infused with Zen principles and a sense of humor, emerged during the thirty years he spent cooking at the Tassajara Zen Center in Northern California. Defying preconceived stereotypes, Brown is not the orthodox Zen priest you might expect. Making his film debut as the subject of German filmmaker Doris D?rrie’s new documentary How to Cook Your Life, Brown colors the big screen with a range of emotions, leaving viewers to feel like they have known him for years. Brown’s consistent outlook remains cohesive between the kitchen and the temple, making an exchange with him a truly refreshing experience. In this interview, Edward Espe Brown relays to Yogi Times that each moment bears the seed of awakening within it. Cultivating that moment and entering the divine can start right in your very own kitchen with even the simplest actions such as washing rice or kneading bread. YT: I’ve heard in a serious Zen practice it’s inappropriate to savor food. Does that work for you? YT: So you found a way to balance your Zen practice with your love of food? EB: Yes, I think it’s perfectly possible. When you experience things closely enough, then you make wiser choices and they come out of your careful experience whether it’s through food choices, relationship choices or other various choices in your life. That’s basic Buddhism. You’re learning how to trust your observations and perceptions rather than your unconscious chosen decisions. You’re actually waking up and widening your perception. YT: In the documentary, we see you releasing a lot of different emotions. Is cooking an emotional process for you? YT: It’s been said, “You are what you eat.” How does that fit into your philosophy? EB: You know, I think there are some truths in that and in Zen philosophy at the same time. We emphasize, “You are how you eat.” How you eat has more to do with tasting things carefully. When you taste something, do you taste the earth, the sky, the sunlight and the water? Do you taste the effort and work of other people in the growing and preparation of the food? Is there any sense of thanks, appreciation or gratitude? YT: In our society of abundance and waste, how can we find value in food and make it precious again? EB: Well the main thing to making food precious is to quiet and calm ourselves enough to let the experience touch our hearts. Usually we’re experiencing a sense of business to get things done and then we’re so busy getting things done that even eating becomes getting something done. So in a way what becomes precious is our capacity to slow down and actually receive things. It’s the gift of our own consciousness. And that’s true of anything. YT: As individuals we seem to be experiencing a growing sense of separation. How would improving our relationship with food help to overcome this sense of disconnection? EB: I think rituals help. A psychoanalyst pointed out that cultures that hold rituals around food have less eating disorders than cultures that don’t. And our culture is a good example. Do you eat standing up? Do you eat in your car? Do you eat walking down the street? Or do you actually sit down and have a few moments of silence? Do you say a prayer and bless the food? Do you have some intention of receiving the preciousness of the food into your body and being? When you do, then you start to sense a connection because you are actually practicing the act of showing up and being present for something. YT: I get the feeling that cooking is a very sensual experience for you. Can you describe to us your experience in preparing vegetables for example? EB: For me, when I handle vegetables, there is something very precious about them and I want to bring out the best in them. That’s cutting things, tasting things and sensing things closely enough to know what I like, what I don’t like, and how to honor the sincerity and integrity of the vegetable. One of my friend’s teachers used to ask, “Chef, what are you making?” And he’d say, “Carrot soup.” Then his teacher would ask, “What should carrot soup taste like?” He was supposed to say, “Carrots.” Some people would put in orange and ginger, fresh basil and some chili and say, “Isn’t this good?” It may taste good but you have lost the preciousness of a carrot being a carrot. I say to people, “When a radish can be a radish, you can be you! And when the radish is good enough being a radish, then you are good enough just being you.” You may be thinking, “I’ve got to turn these carrots into something spectacular,” and the next thing you know, you’re thinking, “I’ve got to turn myself into something spectacular!” To me, it’s more important that you appreciate a carrot being a carrot and you being you rather than thinking you need to turn it into something other or better than it already is. YT: The holidays are approaching, which are often a time of intense and unconscious consumption. Can you offer any advice to our readers? EB: To me, carefully tasting what you put in your mouth is extremely important. By giving yourself over to the experience and by allowing yourself to actually find out what’s in the experience, whether it’s actually wholesome or unwholesome, pleasant or unpleasant, when you do that you’ll make wiser choices. Waking up is something we can do any time and food is something we do every day. It’s such a good time to practice this intention, to be more awake and receive the experience that exists in our hearts. Zen Chef Edward Espe Brown is author of the famous Tassajara cookbooks including, The Tassajara Bread Book, The Tassajara Recipe Book and Tomato Blessings, Radish Teachings. He has been practicing Zen for over forty years, teaching in San Francisco as well as across the US and Europe.